A composite radio-optical image shows five new clouds of hydrogen gas discovered using the National Science Foundation's Robert C. Byrd Green Bank Telescope (GBT). The spiral galaxy M81 and its satellite, M82, are seen in visible light (white); intergalactic hydrogen gas revealed by the GBT is shown in red; and additional hydrogen gas earlier detected by the Very Large Array is shown in green. The M81 Group of galaxies, 11.8 million light-years from Earth, are interacting gravitationally with each other, as shown clearly by the gas streaming among them. The newly-discovered gas clouds, each containing from 14 to 57 million times the mass of our Sun, are similar to gas clouds also found near our own Milky Way Galaxy. Astronomers analyzing these M81 Group clouds conclude that they are likely remnants of earlier interactions among the galaxies and that this indicates that their analogs near the Milky Way had a similar origin. The research team is: Katie Chynoweth, a graduate student at Vanderbilt University; Glen Langston of the National Radio Astronomy Observatory (NRAO); Min Yun of the University of Massachusetts; Felix J. Lockman of NRAO; Kate Rubin of Lick Observatory; and Sarah Scoles of Cornell University. The astronomers presented their findings to the American Astronomical Society's meeting in Austin, Texas. 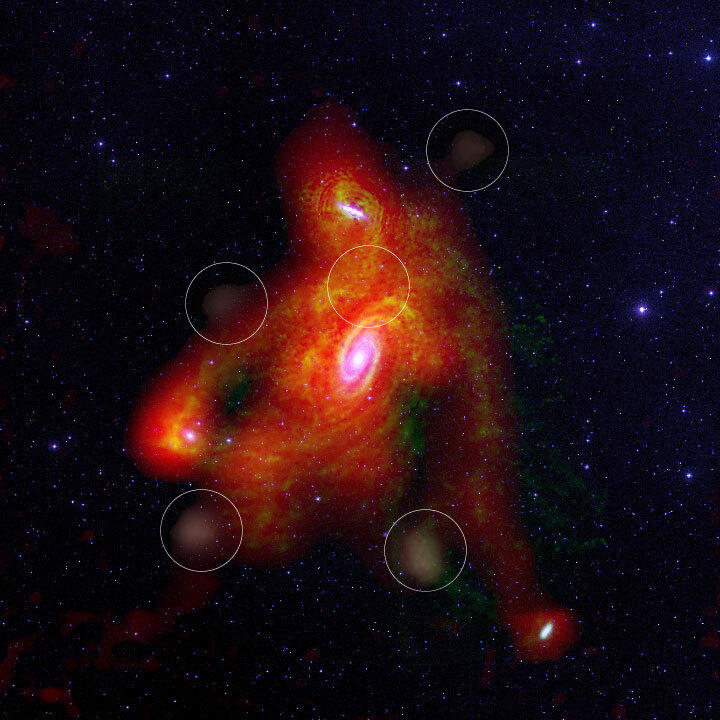 Credit: Chynoweth et al., NRAO/AUI/NSF, Digital Sky Survey.